If I inspire you to do anything, I hope it has something to do with art or… power tools!!! Maybe most women my age don’t get excited about power tools… but, I do! This is the new baby in the arsenal. 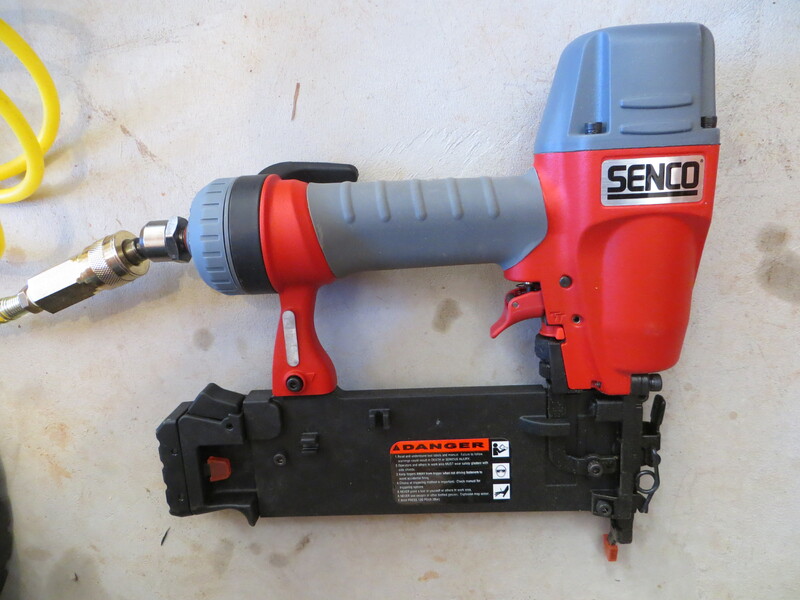 While the nail gun my brother gave me is bigger and “badder” than this little Senco, this one fits me perfectly. Not too heavy. Not too big. Which means I can’t shoot 3″ nails with it… but, I’m not building a house, I’m just working on smaller finishing projects. Working on finishing the trim around my door. Nailing strips onto my ceiling. Reinforcing cabinets. This little firecracker has handled it all quite well, thank you! My first Girl Scout badge was woodworking!! I’ve always loved tools, too…probably because I spent a lot of time with my Dad and Grandpa as a youngster. And knowing how things work, and how they go together (or get taken apart) has fascinated me always. So after 30 years in a apt. with a small set of necessary tools, I now have a nice work bench and LOTS OF TOOLS in my basement! But I know I won’t need a cool power nailer like you! Enjoy it and the time it will save you. You should get a commission for this post. Great! You found one that will work for a woman’s smaller hands…. need the same type for all other situations in place of the heavy stuff… pink – uggh too on pink camo guns etc…. You are soon to get your room all done & just like you want it…. Count me as one who loves power tools and gets excited about them. I have never used air tools but would like to try them as I do have a small compressor. Most of my house projects are done now, but I sure could have used a more powerful nailer when I was putting up new trim in the house. I like the pink tools too, not only the color but they don’t disappear from my tool bag like the other colors. OoOohh! If I had a shop full of tools, power and otherwise, I’d be in my glory!! I Like pink, but practicality rules. I ♥️ women who ♥️ power tools.